Yet another reason for "JBO-25014: Another user has changed the row with primary key oracle.jbo.Key"
I've discussed one possible (tricky) reason for JBO-25014 error in one of my previous post - 'What you may need to know about Nested Application Module' . Recently I noticed yet another interesting reason for the above said JBO-25014 error. Let me summarize the same for the benefit of the ADF community. 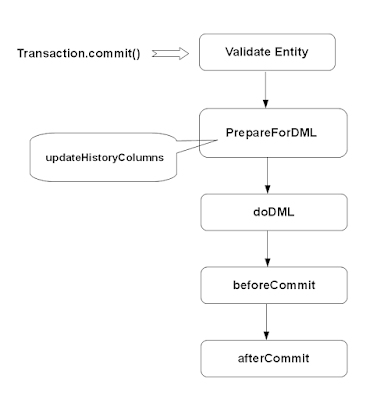 This use case has two view objects - SimpleEmployeeViewObject and DetailedEmployeeViewObject, both are based on the same entity object - EmployeeEntityObject. A specific business functionality is implemented using the above ViewObjects as listed below. 1. SimpleEmployeeViewObject queries the DB by calling SimpleEmployeeViewObject.executeQuery(). The code doesn't fetch any records at this stage(I meant that, this code just got the executeQuery call, no iteration logic). However this call results in the creation of result set/cursor, and leaves it opened. <af:setPropertyListener> not working on <af:popup> with childCreation="deferred" ! You should be careful while using <af:setPropertyListener> on <af:popup>. There is a known limitation when you use <af:setPropertyListener> with 'popupFetch' type to initialize the properties/parameters for a <af:popup>. The relevant jsf snippet may look like as shown in the following diagram. I recently came across a use case where the requirement was to fetch Attribute Hints(display width, label etc.) for a View Object(and Entity Object) on the fly from an external system. Let me share a simple possible solution for this specific use case. The idea is to override ViewRowImpl::createViewRowAttrHints(AttributeDefImpl attrDef) to return a custom implementation of ViewRowAttrHintsImpl class. The same concept has been discussed in one of my previous post sometime back - Decorate UI with view row Attribute's User Interface hints. Please note that, this is the place( custom ViewRowAttrHintsImpl class - LazyViewRowAttrHintsImpl) where we are adding the hook to retrieve the Attribute Hints from third party service. You can use contentStyle attribute to override the default width of specific types of UI controls. This property is applicable for single select and multiple select controls( af:selectOneChoice, af:selectManyShuttle, af:selectBooleanRadio etc.) and input controls( af:inputText, af:inputRangeSlider, af:inputListOfValues,af:richTextEditor etc. ). If the field is wider than the space allocated, the browser will not truncate the field but instead will take space from the label columns. This potentially could cause the labels to wrap more than you would like. In this case, you may want to consider reducing the width of the field contents (for example, use a smaller contentStyle width on an inputText component).